Goodreads says, "Nicholas was afraid of the dark outside his door, the bushes where the giant bugs live, and the underside of manhole covers. His dad was not afraid of anything. Nicholas wants to be as brave as his dad, but he needs help. That s why he needs a dinosaur. After all, dinosaurs like the dark, bugs are nothing to them, and they eat manhole covers for lunch (and everything under them for dinner). With his toy dinosaur, Nicholas can scale tall walls, swim in deep water, even score a goal against the huge goalie everyone calls Gorilla. But when the dinosaur goes missing, everything is scary again. Luckily, his dad knows that even the bravest people can get scared, and it s okay to ask for help facing your fears. It s just guy stuff. A family classic in the making from the dream team of Newbery Honor-winner Gennifer Choldenko and Caldecott Medal-winner Dan Santat." In case you somehow missed it, I have a dinosaur loving preschooler, so when this book showed up on my doorstep for review, he was thrilled. We read a lot of dinosaur books, which I have mentioned before, but Dad and the Dinosaur one is one of our favorites. What makes it stand out? The fact that it's so, so relatable. It's about a young boy named Nicholas, who, like a lot of other young children, is afraid of many things. But he doesn't let these fears stop him as he has a plastic dinosaur that he keeps in his pocket to help him be brave when tackling those big and not-so-big moments in life. For example, Nicholas keeps his dinosaur in his pocket during all of his soccer games. Throughout the book, we see Nicholas going through the daily motions of his life along with his dinosaur, both the plastic toy and the "bigger" dinosaur that follow him around boosting his confidence. But things go awry in Dad and the Dinosaur when Nicholas loses his precious dinosaur during his soccer game and he tells his dad, Big Nick, about it. They decide to go back to the soccer field to look for it and thankfully, they find his lucky dinosaur and everything is ok with the world. I love so much about Dad and the Dinosaur. One being that the dad is a larger than life presence in his son's life, just like his lucky dinosaur. Their relationship really made me happy as his dad is there for him. Secondly, I love that this story not only addresses fears that many young children have, but also teaches them how to overcome them and be brave. But Nick's dad reassures his son that it's ok to be afraid and it's a natural part of life. My son not only loved this story since it's so relatable, but I really enjoyed reading Dad and the Dinosaur to him too. It's nice to read a dinosaur story that isn't just about dinosaurs eating each other or being disruptive. 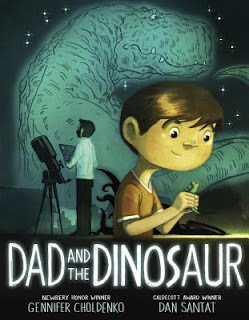 Dad and the Dinosaur is a like a fresh breath of air and not your traditional dinosaur tale, which I really appreciated. If you have a little one in your life that is a big dinosaur fan or would appreciate a story about overcoming your fears, I encourage you to check out Dad and the Dinosaur this spring. It's one of our favorite children's books of the year. This sounds super adorable! I can see why it would be a big hit with your family and I'm sure lots of other little kids love it too. One of my coworkers has a son about the same age as yours who loves dinosaurs so I am going to recommend this to her. Thanks for your review! Yes! Definitely let her know about this book. It is too cute and I love the book's message. Thanks for visiting, Christina! This sounds completely wonderful! It's always fun to find adorable kids books that are just as enjoyable to read as an adult! Thanks for sharing about this one, Christina!